A Danny Shittu own goal gave Brentford their third straight league win after Millwall had recovered from 2-0 down. Striker Andre Gray latched on to through balls either side of the break, finishing both times with a low shot, to put the visitors into a 2-0 lead. Millwall got back into the game when defender Shittu headed in before Alan Dunne's drive levelled. But Gray turned provider for the winner as his cross was diverted in by Shittu, although Dunne headed wide late on. Millwall wore a special camouflage-style shirt for this London derby to commemorate Remembrance weekend. But Ian Holloway's side have now won just once in their last 12 matches. Gray threatened early on for the away side with a shot that went narrowly wide, and he was denied by a last-ditch tackle by Lions defender Mark Beevers soon after. But the 23-year-old got his third goal in three games when he ran on to Alex Pritchard's through ball and finished underneath Millwall keeper David Forde to give Brentford a half-time lead. And Gray scored his seventh of the season, after being played in by Alan Judge, with a composed finish 10 minutes after the interval. But Holloway's Millwall, who came from two goals down to earn a point against Blackburn in midweek, threatened a repeat when Shittu headed in from the corner of the penalty area. The home side equalised a minute later when captain Dunne's shot from outside the area found the bottom left-hand corner. But Shittu inadvertently scored the winner for the visitors 25 minutes from time when he got the final touch on Gray's ball into the box. Millwall missed a great chance to equalise 12 minutes from time as Dunne headed wide from Lee Martin's set-piece delivery. 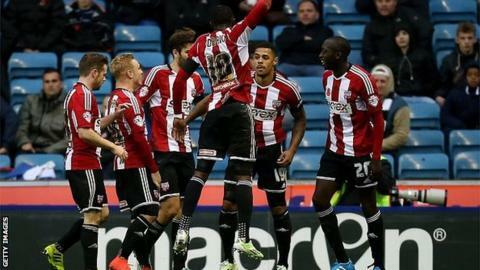 But the win moves Mark Warburton's Bees into the Championship play-off places, while Millwall fall to 18th. "Fair play to them, I knew how good they were. I knew what they would do to us. "They came here and I knew they were going to pick our pockets. Without Scott McDonald we didn't know how to press. "I think that's the only team who actually deserved to beat us this season. They certainly aren't little Brentford anymore. "At the minute I've got a massive problem because not all of my boys are as fit as they need to be. "I know the mountain in front of me but I can't wait to climb it." "He [Gray] has terrorised them. He's raw, he's hungry, he's quick, he wants to learn, he's just turned 23 and there's loads more to come from Andre Gray. "When you think he was playing Conference football last year it speaks volumes for his character. He can go to the Premier League, I've got no doubts about that. "Hopefully you've seen that they can and this week has been very pleasing." Match ends, Millwall 2, Brentford 3. Second Half ends, Millwall 2, Brentford 3. Sam Saunders (Brentford) wins a free kick in the defensive half. Attempt saved. Sam Saunders (Brentford) right footed shot from outside the box is saved in the bottom right corner. Assisted by Moses Odubajo. Offside, Brentford. Sam Saunders tries a through ball, but Andre Gray is caught offside. Attempt missed. Stuart Dallas (Brentford) left footed shot from the left side of the box misses to the left. Assisted by Jake Bidwell. Offside, Brentford. Tommy Smith tries a through ball, but Andre Gray is caught offside. Attempt missed. Mathias Ranégie (Millwall) right footed shot from the centre of the box is too high. Attempt saved. Alan Judge (Brentford) right footed shot from more than 35 yards is saved in the bottom right corner. Attempt saved. Tommy Smith (Brentford) left footed shot from outside the box is saved in the centre of the goal. Assisted by Alan Judge. Substitution, Millwall. Ed Upson replaces Richard Chaplow. Foul by Andre Gray (Brentford). Matthew Briggs (Millwall) wins a free kick in the defensive half. Attempt saved. Mathias Ranégie (Millwall) right footed shot from the left side of the six yard box is saved in the bottom left corner. Assisted by Alan Dunne with a cross. Corner, Millwall. Conceded by Tony Craig. Matthew Briggs (Millwall) is shown the yellow card. Corner, Millwall. Conceded by Harlee Dean. Attempt blocked. Alan Judge (Brentford) right footed shot from outside the box is blocked. Assisted by Tommy Smith. Attempt missed. Alan Dunne (Millwall) header from the centre of the box misses to the left. Assisted by Lee Martin with a cross following a set piece situation. Alan Dunne (Millwall) wins a free kick on the right wing. Attempt missed. Lee Martin (Millwall) right footed shot from outside the box is too high from a direct free kick. Substitution, Brentford. Sam Saunders replaces Jon-Miquel Toral because of an injury. Mathias Ranégie (Millwall) wins a free kick in the attacking half. Offside, Millwall. Alan Dunne tries a through ball, but Ricardo Fuller is caught offside. Lee Martin (Millwall) wins a free kick in the defensive half. Attempt missed. Lee Gregory (Millwall) right footed shot from the centre of the box is too high following a corner. Corner, Millwall. Conceded by David Button. Attempt saved. Ricardo Fuller (Millwall) right footed shot from the right side of the box is saved in the bottom left corner. Assisted by Lee Martin with a through ball. Attempt saved. Mathias Ranégie (Millwall) right footed shot from outside the box is saved in the top left corner. Assisted by Lee Gregory.